The simple silk jacket reminds me of my mother HO Sue Shee [何蕭氏] in her youth in China when she learnt to be a seamstress. She embroidered the traditional buttons and then sewed them onto jackets for a living. When she was in her eighties, I remember her wearing this jacket to keep herself warm in the cooler winter months, in Mangere. The glass jar was used in the 1950s to sell jaffas or pineapple chunks in our greengrocery store Jang Hing Fruit Shop. The sweets have gone but her passport photo remains, symbolic of the start of her new life in New Zealand at the commencement of WW II. In earlier Chinese generations, a woman rarely disclosed her own given name after her marriage. Instead, she used her husband’s surname followed by her maiden name. This was common in a patriarchal society where the woman has become a member of her husband’s family and no longer has an individual identity after her marriage. She is considered a Nobody until she has brought up her own kids. At the senior age, she would regain her individuality and would be respected by her sons, daughters and their families. HO Sue Shee [何蕭氏] said that she didn’t have a name* and followed the tradition to use her husband’s surname followed by her maiden name for her whole married life. She arrived in Auckland in 1939**. Life was especially hard during the Depression. From 1949, she managed to support her husband and brought up their five children while taking up market-gardening under the name Chong Ho. She later helped run her family’s Jang Hing Fruit Shop [振興蔬果店] in Mangere. 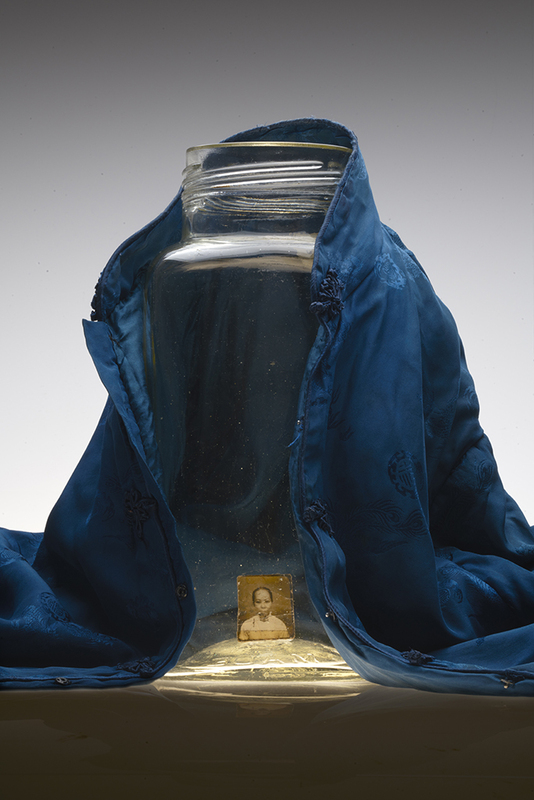 I placed HO Sue Shee’s portrait photo inside a glass jar from the Jang Hing Fruit Shop and draped the bottle with her silk jacket. With the light coming from the ‘bottom of her heart’, HO’s ‘covered up’ self-identity radiates outwards. Like many other Chinese wives, she wasn’t a Nobody. She is respected and remembered by her descendants. In daughter Lily LEE’s (HO Bik Har [何碧霞] aka HO Li Li [何莉莉]) portrait, she is wearing her mum Sue Shee’s Chinese silk jacket, and the opal ring that was given to her in her thirties. The silk jacket not only keeps Lily warm at home in the winter time but spiritually connects her with her mum. * Refer Lee, P. & Lee, L.. Ho Sue Shee: A woman from Zhong Shan. Retrieved on August 2018 from http://www.zhongshan.nz/en/pioneers-stories/44-a-woman-from-zhong-shan.html#the-story-of-sue-shee.